We took Hannah up to Oregon Ridge yesterday after her non-nap to check out the turtles at the Nature Center and hike around the trails. I was bummed that I forgot my camera, but then I remembered that I've recently joined the ranks of people who have cameras in their cell phones. How convenient! Hannah rode in the backpack for about a half mile or so and then insisted on getting down and walking for herself which was just fine with us since a slow pace gave Eric time to look for animal holes in the tree, and it worked for me since it meant I could focus on my surroundings rather than on dancing around like a crazed monkey trying to keep her entertained and seated (she usually likes the backpack but wasn't into it yesterday). 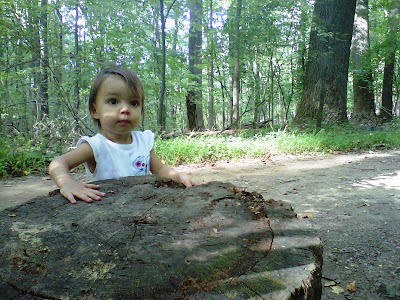 She played at this tree stump for a while, alternating between lapping it and pulling off loose pieces from the surface and pitching them to the ground.